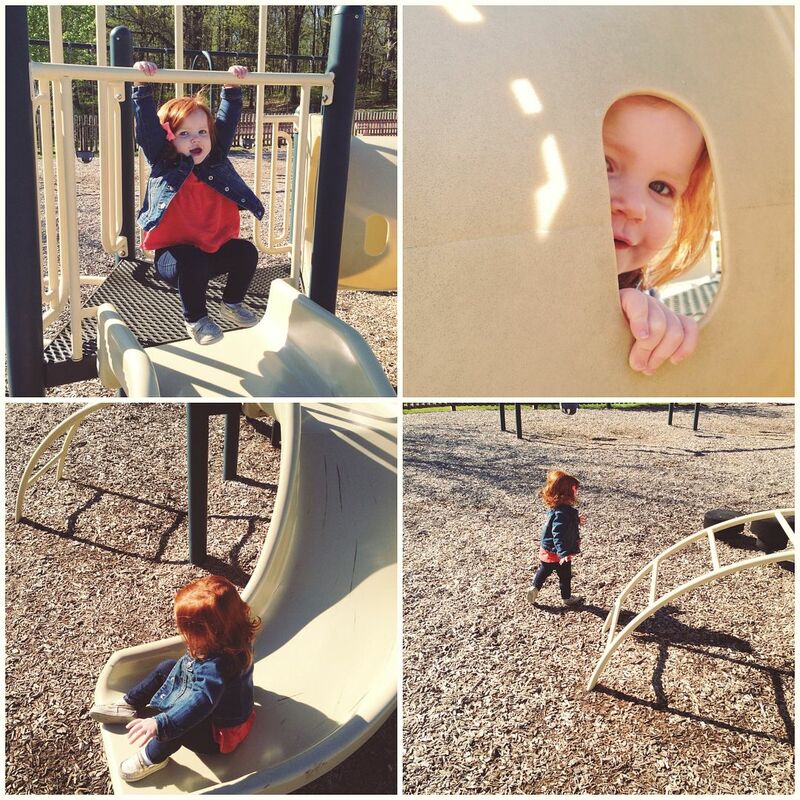 Toddlerhood has got to be one of my favorite ages (and all the mamas out there called me crazy!). Yes, I am currently dealing with some early stages of the terrible twos, but all of the fun stuff that Baby K is getting into makes the terrible twos so much more bearable. All my child has to do is run down the hall and into my arms for a big bear hug and I forget all about the fact that she just threw an embarrassing fit when we had to leave the park (to go home and play with bubbles no less). I love this age/stage for many reasons, but the biggest reason has to be the fun little quirky things that Baby K does. All little kids are so adorable at this age, with cute little voices. I had to share some of the fun things about K that really make me smile. I know there are more, but these are the top ones. - If I give K two options, she will ALWAYS choose whatever I say last. Me: "K, would you like to play with Roo or Mickey Mouse?" K: "Mickey Mouse"
Me: "Would you like to play with Mickey Mouse or Roo?" K: "Roo"
I have learned that I can use this to my advantage!!!! - It is no secret, I like to keep my house neat and tidy (check out this post for my cleaning schedule). Well it never fails, when K sees me mopping or sweeping, she will run and grab her broom. Every.Single.Time. - I'm not quite sure why my daughter has a fascination with washing her hands and brushing her teeth ("wash hands, brush teeth") but she loves to do both and asks about them a lot. - I taught K to say Happy Birthday back in February when my sister had one to celebrate. Well now, K thinks anytime someone has a birthday that it is also Flash's birthday (that's what she calls my sister). - My child can be mid-tantrum and we can tell her that it is bath time or time to play with bubbles and she will immediately stop her fit! - Because Baby K hears us use the possessive of people's names (that's Daddy's phone, that's Mommy's car) she now adds an -s to everyone's names. In fact, this past weekend she was convinced our friend's oldest son was actually named Coopers. - The way she says virtually anything causes me to melt, but my favorite is how she says sit down, "sheet down." - There is no differentiation with up and down as far as her asking for one or the other. She uses the same phrase (which actually is run together so much it sounds like one word) and it is up to Tolar and I to figure out if she wants up or if she wants down: "upanddown." What about you? Any fun little quirks that the little person in your life has? I'd love to hear!!!! I'm glad Jenibelle isn't the only one that will stop anything for a bath (or shower.) lol She is also obsessed with brushing her teeth. Her preferred chore is dishes. Her favorite thing to say lately is, "I made it!" No matter what she's stacking, building, doing, it's I made it, which makes for cute conversation with her brothers. She also likes to say please and thank you for everything. They're just too adorable to be mad at, at this age for the ornery things they're doing. I can't wait til yall are in the area again to see how they react to each other. I agree with you 110% about loving this stage. Every stage is beautiful and special for different reasons but if I had to choose a favorite it would definitely be age 2.5 to her (my daughter's) present age of 4. When they begin to speak and understand it's just amazing and so fun. Even when my daughter is being defiant or having and epic tantrum I am silently smiling because it's awesome. They're developing their personalities and sometimes you can imagine how they will be when they grow up. I can't even begin to talk about all my daughter's quirks because we'd be here a while. But I document my conversations with her and sometimes share on FB because the logic and reasoning behind the things they say is mind blowing. Love it!